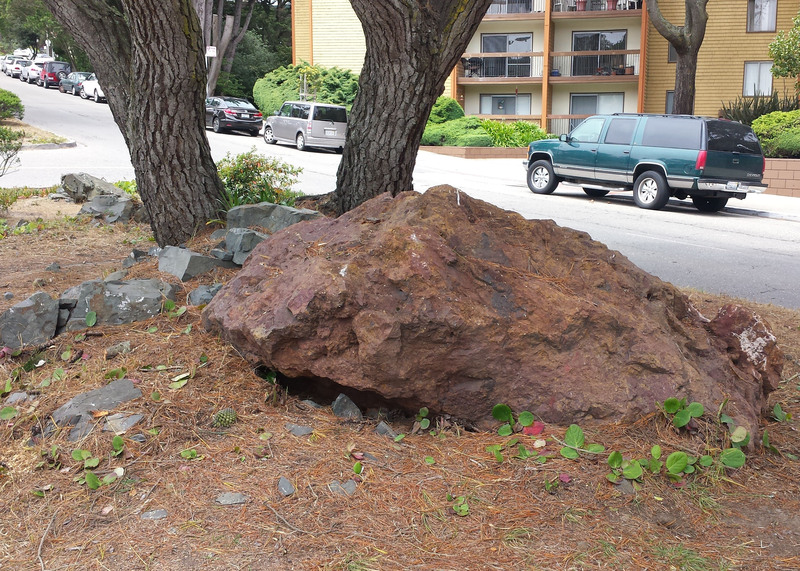 At some point in the 1960s, several meteor-like boulders landed on the median of Diamond Heights Blvd. The neighborhood was young. Just a few churches and a lot of open space. Archival photographs from the early 60s reveal nothing on the boulevard median but a few saplings. Years of vegetative growth have obscured their impressiveness. Until now, their origin was known to only a handful of San Franciscans. Helen wanted to build a home, but the lot was prohibitively steep and rocky. She had an idea. She phoned the City and offered to “donate” her lovely red rocks. The City showed up with a crane and some earth-moving trucks. The contractor was called Sheety Sheedy Drayage Co., which quickly became a family joke. Why would anyone pay to hire Sheety Sheedy trucks? 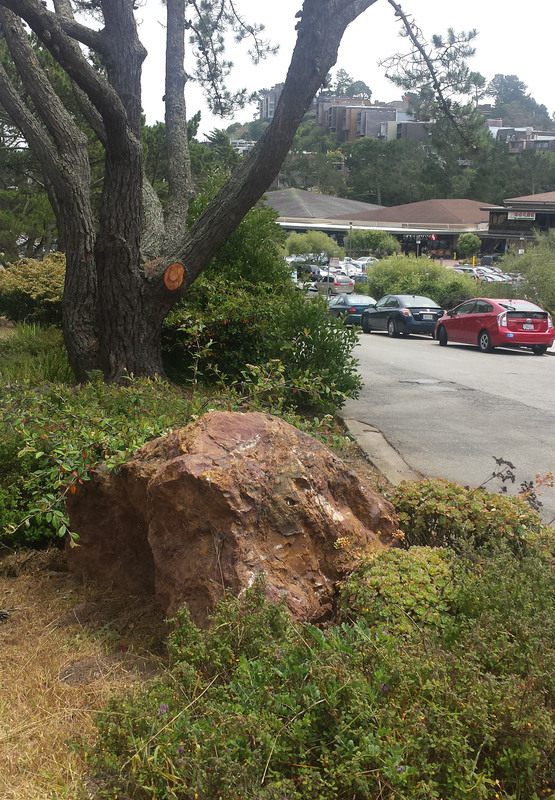 The workers loaded up the boulders and hauled them less than a mile up the hill to Diamond Heights Blvd., placing them on the median where they can still be enjoyed today. As a side note, the house that Helen built is a 2-story, 2,000 square-foot, 7-room residence that sold in 1970 for $63,000. Today, the lot has an estimated value of $1.6 to $1.9m. 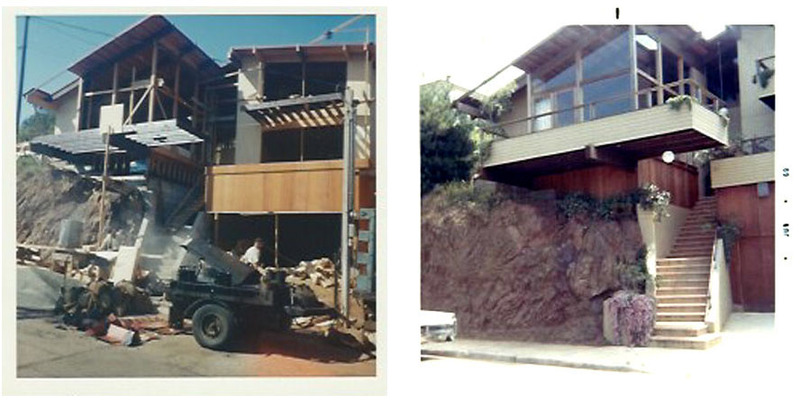 Helen’s daughter, Gale Bradley, lives on Twin Peaks in another house that Helen built, overlooking that same view. Gale shops in the Diamond Heights Safeway. Thank you to Gale Bradley and Alan Hugenot for sharing this story and photographs. *the combined area of the median islands between Duncan Street and Berkeley Way is 43,151 sq. ft. One acre is 43,560 sq. ft.